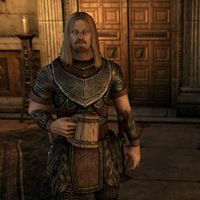 Grundskar is a Nord fighter who is first encountered near the Orchard wayshrine after he was injured while fighting vampires. If you speak with him, he will tell you the location of a tomb he found while escaping. When you have to deliver bad news to him, he can be found at the The Shining Star in the Hollow City. He can be found injured near the Orchard Wayshrine. "Damned bloodfiend took a piece out of my arm." "I got separated from my troop and a group of bloodfiends chased me. I hid in the entrance to a tomb, just to the west of here. If not for my injuries, I would have explored the place. I'm sure there's some fabulous treasures buried inside." What makes you think there's treasure inside? "My cousin, Nettira. She knows all about tombs and ancient ruins and things like that. She spotted the name on the tomb before we got separated. Said it was an old Dark Elf name. Mal Sorra's Tomb. Treasure and Dark Elf magic. I'd stake my name on it." He can be found drinking in the inn. "I admit I was worried about my cousin, but you have settled the question as to her fate. I'll miss Nettira, but at least I know what happened to her." This page was last modified on 3 February 2019, at 09:22.